My Thai Pork Pizza is a unique combination of my Homemade Hoisin Sauce, my Kalua Pork, fresh ginger, onions, garlic, cilantro and cabbage. These pizzas make up very quickly if you have the pizza dough in the freezer and the Kalua pork already made. You can also use cooked chicken in place of the pork. This recipe is for 4 but you could easily do it for more or less people. The secret ingredient in this recipe is the homemade hoisin sauce. Why do I have two pizza dough recipes listed? 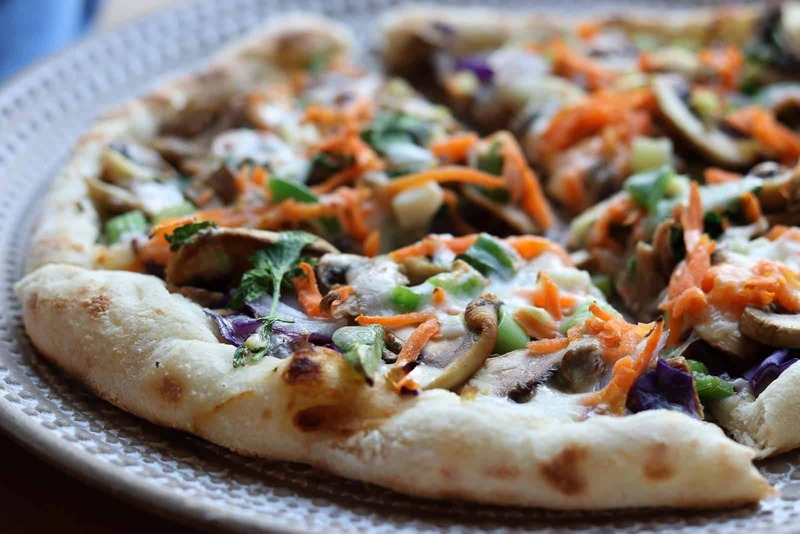 Originally when I created this Thai Pork Pizza I used my Whole Wheat Pizza dough recipe. 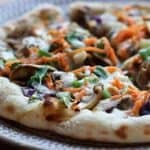 While this is a good recipe, I recently have created my Homemade Thin Crust Pizza dough recipe using 00 Caputo flour which results in a much better crust. This crust can stretch super thin, so it’s a much bigger pizza and you can add more healthy toppings. While making the Thai pizza with the newer crust results in 13 WW Freestyle Smart Points vs the original 9 using the old crust, this pizza is much bigger and instead of eating the whole pizza, just eat a few pieces. You’ll love the new crust much better I think. My Thai Pork Pizza is a unique combination of my Homemade Hoisin Sauce, Kalua Pork, fresh ginger, onions, garlic, cilantro and cabbage. These pizzas make up very quickly if you have the pizza dough in the freezer and the Kalua pork already made. You can use cooked chicken as well or even make it vegetarian. The secret ingredient in this recipe is the homemade hoisin sauce. Thaw out pizza dough on counter early in day, at least 3 hours ahead of time. Preheat oven with pizza stone to highest setting 500°. If you don’t have a pizza stone, preheat to 450°. Roll out dough and place on a pizza stone or baking sheet with parchment. Bake pizza crusts for about 5 minutes, just until baked but not brown. Spread 1 T. hoisin sauce over evenly over each crust. Divide up remaining ingredients among pizzas with cheese being the last ingredient. Bake again for about 5 minutes or until done. These go super fast if you already have the dough in the freezer and you have leftover Kalua Pork). You can also use cooked chicken breasts, in place of pork. This lowers the Smart Point count to 7 points per pizza. No Replies to "Thai Pork Pizza"